98 Year-old WWII veteran a beloved man in his community. 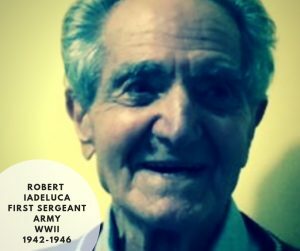 Robert Bancker Iadeluca served in the Army during WWII from 1942 until 1946. He was in the infantry and rose to the rank of First Sergeant. During is active duty, he was stationed in England, France, Belgium, and Germany. Robert Iadeluca, known by many in the community as Dr. Robby, was inspired to serve because: “My nation needed us.” After being discharged from military service he transitioned into a civilian career which led him to become a Scout Executive with a B.S.A. Throughout his professional career, Dr. Robby never stopped learning. Education and knowledge is important to him, so he continued his education and became Dr. Robert Iadeluca. He has inspired many in the town he worked with his professional skills, but also through his sense of community — of becoming involved with local residents and providing words of wisdom and advice which spans generations. Dr. Robby recently celebrated is 98th birthday and today is still involved with the community. Although he retired from his practice only a couple of years ago he still wishes to serve people in his local region. He attends Fauquier Chamber of Commerce luncheons as often as he can and remains in contact with businesses, organizations, and of course his friends. “For almost a decade, Dr. Robert ‘Robby’ Iadeluca generously shared his wisdom, education and life experiences with the fine people of our region in Warrenton Lifestyle Magazine. I looked forward to each article. Robby is one of those people that everyone likes and gravitates toward in a public setting. Few of us have lived a life as fully as he has and he still has so much to offer. He is smart, gracious, kind, persistent, witty, compassionate, and always a true gentleman. We should all be more like him. Dr. Robby’s has always enjoyed sharing his wisdom, and he once again wanted to share an old phrase he felt was still significantly important, especially to the younger generation: “It is more of a blessing to give than to receive.” These words have significant meaning and Hero’s Bridge hopes we may continue to give as much as we can, especially to Dr. Robby and all the older veterans in our community. Dr. Robby, thank you for your service to this nation and to your local community.